KINGSTON, ON, Canada - Vending machines at the Ambassador Conference Resort here are now equipped for purchases of snacks and drinks by patrons using their cellphones in place of cash. A trial of the vending technology, which proved a success and led the resort to continue it, was the first in Canada to combine both mobile phone and cardkey technologies over a wireless network. Guests at the resort can use their mobile phone or room keycards to purchase Coca-Cola products from vending machines. With a cellphone, a customer dials the number listed on the machine and makes a product selection; the charge appears on the guest's hotel invoice at checkout. The cellphone vending system has proven to work with current handsets, with no need for patrons to upgrade to a newer cellphone to use the service. Following installation of the cellphone technology, resort officials reported increased sales and an improved guest experience. The cashless system also reportedly reduced the time spent by hotel staff in dealing with coin exchanges and coin jam problems. At the Ambassador Conference Resort, Coca-Cola is the vending and product supplier, Bell Canada provides the wireless service, and cStar Technologies is the vending and wireless technology enabler. Existing vending machines can be updated with cStar's processing module to handle cellphone and smart card transactions. 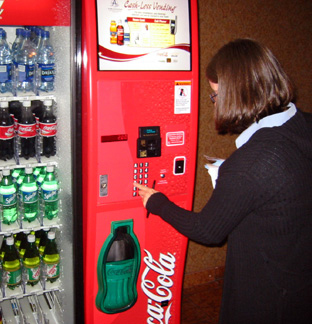 The vending machine does not require a wired connection to process a cellphone transaction, as the installed module can create a wireless link to forward the transaction data. In November of 2005, the three major Canadian telephone operating companies, Bell Canada, Rogers, and Telus, formed a consortium to move forward on mobile commerce initiatives in 2006. This includes pursuing such micropayment initiatives as mobile commerce transactions from vending machines and other points of service that will appear on customer cellphone invoices. 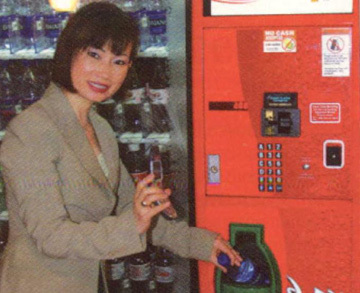 M-COMMERCE: Above, cStar chief executive office Stella Yoon demonstrates the ease of dialing a number to vend a Coke; below, guest at the Ambassador Conference Resort (Kingston, ON) puts her room keycard to good use. Both cashless systems are available, and charges appear on bill at checkout.